On first row is Christan Bates (‘20). On second row from left are Ryann Hamilton (‘20), Noah Edmonds (‘21) and John “Cooper” Miller (‘19). On third row are Nicholas Adams (‘20), Pasha Farley (‘20), Colby Alexander (‘19) and Victoria “Goldie” Howard (‘20). On fourth row are Vani Pandian (‘21), Olufunke Adeleye (‘20), Scott Hebert (‘21) and Taylor Rutherford (‘20). Not pictured are Leila Escoto (‘20), Dalaijsa Payton (‘19) and Eric Stein (‘19). 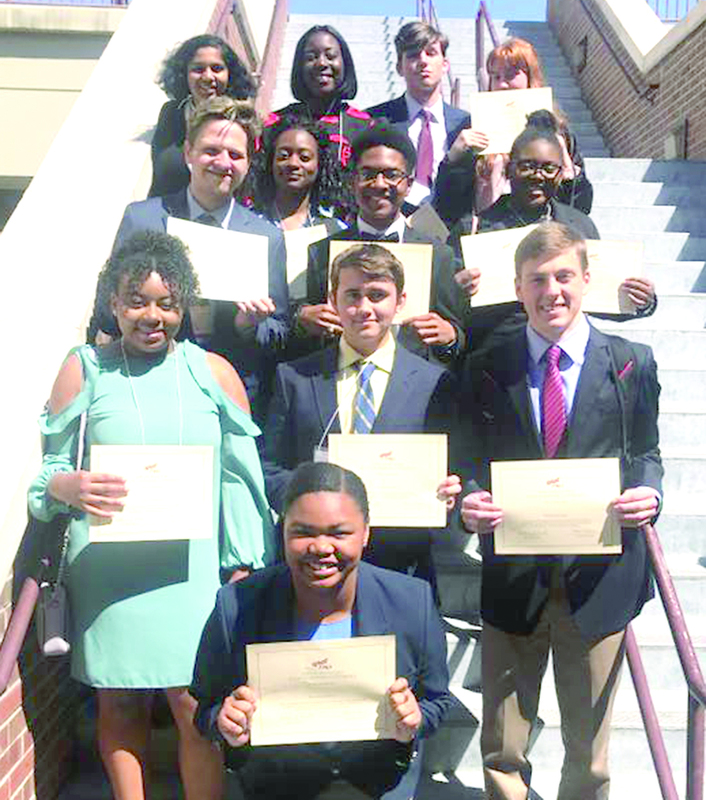 Fifteen students from the Louisiana School for Math, Science, and the Arts’s (LSMSA) Future Business Leaders of America (FBLA) club participated in the State Leadership Conference in Lafayette March 24-26. They competed individually and in teams against more than a thousand students from all across the state in competitions focused on practical business skills involving communication practices, written tests and oral presentations. Eight students placed within the top 10 in their respective areas and will go on to compete in the National Leadership Competition in June. The students are: Victoria “Goldie” Howard (’20), who won second place in Advertising and fourth in Management Decision-Making Chirstan Bates (’20) and Taylor Rutherford (’20), who won fourth place in Management Decision-Making Noah Edmonds (’21), who won fourth place in Agribusiness Colby Alexander (’19) and Scott Hebert (’21), who won second place in Public Service Announcement Dalaijsa Payton (’19), who won third place in Help Desk Nicholas Adams (’20), who won fourth place in Cyber Security. Also placing top 10 in their respective areas are: Leila Escoto (’20), winning seventh place in Public Speaking and seventh place in Banking and Financial Systems Eric Stein (’19), winning fifth place in Personal Finance and seventh place in Banking and Financial Systems Pasha Farley (’20), winning eighth place in Organizational Leadership Ryann Hamilton (’20), winning eighth place in Personal Finance John “Cooper” Miller (‘19), winning eighth place in Business Calculations.